German start up Dadamachines has recently unveiled a novel musical concept in the form of the Automat Toolkit which allows users to essentially use an iPhone and any object around them to make MIDI music. 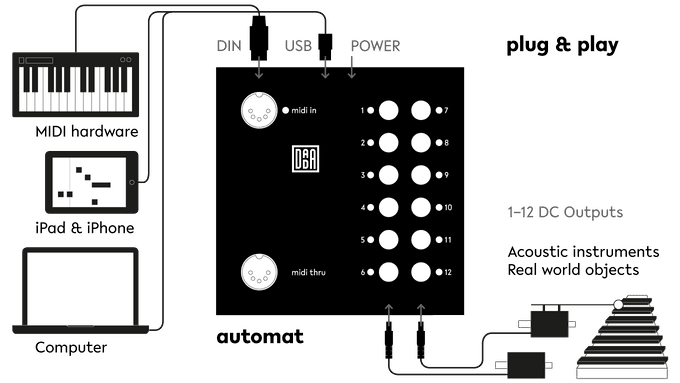 The tool kit allows users to build their own musical MIDI controlled sound machines from scratch with an innovative approach to noise, allowing users to “tap, move, bang, and make sound with the world around [them].” Perhaps most excitingly, the open source machine is incredibly simple to use. The toolkit is centered on the fully programmable Ardiuno-based Automat controller. It contains a number of inputs, allowing the controller to be interfaced with a wide variety of devices, such as condenser microphones, motors, instruments and a wide variety of everyday objects. The controller can be programmed by connecting it to a computer, keyboard, or even an iPhone via USB and is compatible with software like Ableton Live. The startup is offering the kit in a variety of packages; stressing its modularity, compatibility and ease of use. The company is currently raising funds via a Kickstarter campaign; with the promising concept looking like a sureshot success. Watch the Automat in action below.